Cultural Fit: Hire IT Talent like you would do a jigsaw. Have you ever hired a new team member who interviewed brilliantly, had exactly the qualifications you were looking for and on paper had the right experience listed on their CV … but somehow just didn’t fit in? 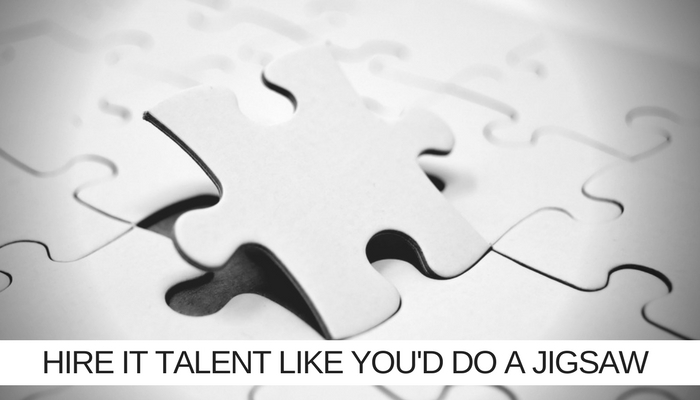 Making the perfect hire is like putting together a jigsaw puzzle and while these are all crucial pieces, without the last, really important piece, the picture can be disappointingly incomplete. That piece is cultural fit. Teams that gel together have always worked better together but cultural fit adds an extra dimension to the mix – now talent whose DNA gels with that of the hiring organisation will get more from the relationship and vice versa. In an environment where marginal gains can make the difference between success and failure, cultural fit is increasingly important in IT. So what can you do to get it right? 1 – Know What Your Culture Is! Sounds obvious but it’s surprising how many firms, organisations and project teams haven’t got this nailed. To return to the jigsaw metaphor, knowing your culture is the equivalent of having a picture on the front of the box to refer to. If you don’t know what your culture is how can you go about attracting talent that complements it? Your business culture is a composite of your vision, mission, values, working practices, methodologies, management style, experience and behaviour – and that’s often just for starters. The criteria that build a culture can vary from sector to sector and even business to business. Cultural fit is compatibility between this and a candidate’s personality, attitude, beliefs, working style, etc. A candidate with a strong fit with their organisation’s culture will be more likely to hit the ground running and be considerably more effective, giving you a greater (and more instant) return on investment. When employees fit in, they tend to stick around and stay in position longer. When recruiting a new team member, many hiring businesses focus first on the skills that will be needed for the role. The trouble with this is that, while these skills may be relevant now, things move fast in IT – what you need TODAY may not be what you need in a year, or for the next project. Current skills can be an unstable foundation for hiring. Much better to aim for cultural fit, unlike role-specific skills, this cannot easily be taught or trained. Although talent can adapt to fit in better over time, this is no match for a natural meeting of company culture and an individual’s attitude and behaviour. The impact that a new recruit who comes “plug and play” ready can have on a team can be transformational, the impact of a poor cultural fit can disruptive and not in a good way! If you do your own hiring then aligning your recruitment strategy and collateral with your company culture is a must. If you have a culture based around achieving best practice then don’t be shy about saying that you’re interested only in candidates who want to do their career’s best work. If you have a culture of staying on task until the work is done then you don’t want to attract candidates for whom late nights and long weekends are not an option. When you recruit don’t fall into the trap of trusting just your instinct about a candidate’s cultural fit with your business. Instinct alone can only take you so far and can, at times, be inadequate and misleading. There are measurable ways to identify compatibility, personality tests, for instance, can quantify how the attitudes of your candidate match up with the culture of your business. An independent third party is best placed to carry this out, often a recruitment firm will deliver an impartial and neutral assessment and if they are worth their fee they will recommend matches using this data and an understanding of your culture. If you use a recruitment firm to find your candidates be sure to use one who understands the importance of cultural fit. Choose a partner who will get to know your culture and the little idiosyncrasies that make you unique. Select a recruiter who can access talent from a database of interviewed candidates and only suggest talent who fits your culture. Finally, ask your partner about shared risk – let’s be honest if the candidate they recommend doesn’t fit and things don’t work out, you shouldn’t be paying full whack! Lastly, the more specialist the role you are looking to fill is, the more important it is to use a specialist recruiter. The best way to hire a project manager who fits your culture is to use a recruiter with specialist knowledge of project management. Subject matter expertise combined with an understanding of your culture make for a potent recruitment mix. Culture fit hiring is helping the organizations to determine the right priority and hire accordingly.